NASA reported a "slow moving" coronal mass ejection (CME) was released from the sun Friday, November 9, 2012 at 10:24 AM EST. The CME is directed towards Earth, according to NASA. 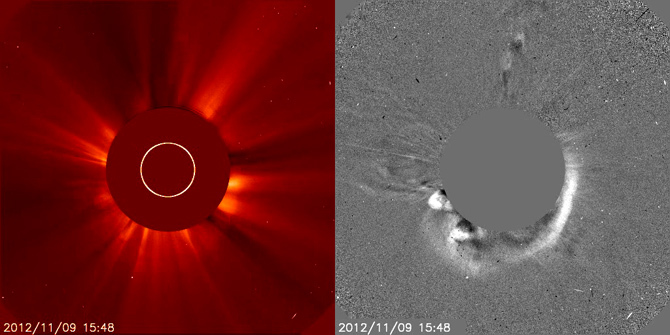 The CME was photographed Friday by the ESA/NASA Solar Heliospheric Observatory (SOHO) at 10:48 AM EST. Large earth-directed CMEs can result in geomagnetic storms which can disrupt satellite communications or electrical devices, but NASA indicates a CME of this nature and magnitude is more likely to simply result in aurora borealis displays near the poles. The CME is moving 350 miles per second towards Earth. NASA did not indicate when the impacts of this particular CME will affect the Earth but did note that CMEs in general "can send billions of tons of solar particles into space and can reach Earth one to three days later." This CME follows a period of relatively quiet solar activity since the X1.8 solar flare released on October 23. For the latest news on solar activity, visit SolarFlareWatch.com. Follow @SolarFlareWatch on Twitter. A writer, teacher, student, mystic, philosopher, beyond-the-box researcher, conscious parent and entrepreneur, with degrees in Computer Science and Mathematics. Host of The Frontier Beyond Fear radio program, now in its 8th year, featuring enlightened wayshowers worldwide. Founder and Director of Lighted Bridge Communications, established in January 2009.